There are so many options when it comes to window coverings, and at Cadillac Window Fashions, we know just how difficult making that choice can be. 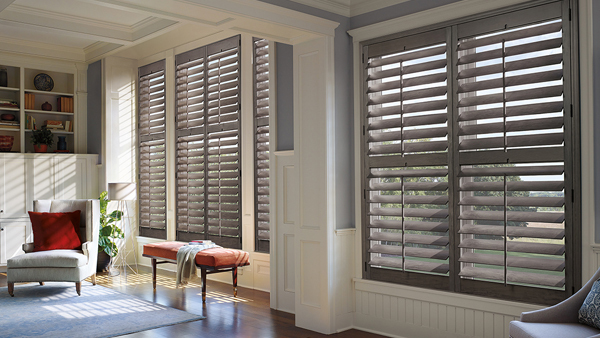 Simply put, shutters are a wonderful addition to any home as they provide a luxurious aesthetic without any hassle! Between wood shutters, California shutters, or a customizable option, you can create a stylish atmosphere that will instantly brighten your mood as you walk through the door. Everyone knows that good things never last and there is nothing worse than falling in love with something that then needs to be fixed or replaced not long after. Well with shutters, that is a thing of the past! All of our shutters are designed to ensure that their colour won’t fade over time. In addition, the beauty of wood shutters will never go out of style, unlike your grandmother’s outdated curtains. Now you can impress all of the neighbouring wives when you have them over for wine and to watch the newest episode of the Bachelor. Sundays are for watching movies all day with your family. With shutters, you are able to create the perfect movie theatre atmosphere by keeping out all light. At the same time, if you want to keep out the light but let in a cool breeze, this can be done by having the shutters closed but opening up the louvers. They are extremely easy to adjust and can be done at differing degrees for those indecisive days. In addition, with the sudden drop in temperature, we understand that all you want to do at home is be cozy and warm. Therefore, don’t rack up those heating bills by installing shutters into your home! They are specially designed to control the temperature of your home by inhibiting colds drafts from entering the room. Shutters Will Class up any Home, No Strings Attached – Literally! How many times a day do you currently spend tugging the string to open and close blinds and getting frustrated when it won’t work quite right? One of the greatest benefits of trading in blinds and installing shutters is getting rid of those annoying strings that never work, or your kids and pets won’t stop fooling around with. Shutters are extremely durable so you can finally trust your children to adjust them and they are extremely easy to clean. At Cadillac Window Fashions we have made it extremely easy to getting you one step closer to turning your home into one of those dream houses you see as you scroll through Pinterest. This can be done by contacting us and having one of our experienced designers visit your home to plan and find the perfect type of shutters for you! We provide beautiful window covering solutions in many homes and businesses throughout Toronto, Vaughan, Mississauga, Scarborough and the GTA. Visit us here to discover more Cadillac Window Fashions.